Ireland women moved closer to qualification for the Super Six phase of the Women’s World Cup Qualifers after a hard-fought 46 run win over battling Thailand in Colombo. It would take an unlikely Zimbabwean win over Group leaders India on Monday to deny the Girls In Green a place in the knock-out stages and with it the prize of continued One-Day International status. Ireland’s total of 218 for 7 was built around the 3rd wicket partnership of 106 in 27.2 overs between Kim Garth and skipper Laura Delany. Garth (98) and Delany (50) both made their highest scores for Ireland, with Garth just missing out on becoming only the sixth Irish player to score a century. Her 98 came from 122 balls (9 fours, 1 six) before she was run out from the penultimate ball of the innings. Amy Kenealy (2-12) struck twice early in the Thailand reply, but solid batting from Narraya Boochatham (44) and captain Sornnarin Tippoch (42) meant their team were always in contention. However Lucy O’Reilly - returning from injury - took 3 for 28, and helped by Ciara Metcalfe’s 2 for 25 ensured Ireland collected valuable points. “It was great to be back on the pitch again with the girls today after my injury and get a comprehensive win,” said 17 year-old O’Reilly. “We are now starting to put in practice some of our skills with confidence. “Hopefully we’re now through to the Super 6’s and we will work hard to qualify to get one of the four places at the World Cup,” added the YMCA all-rounder. Kim Garth’s superb recent form continued as she collected another player-of-the-match accolade, but she was quick to pay tribute to a disciplined Thailand side who made life difficult for the Irish. 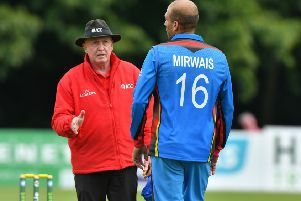 “It was a obviously fantastic to get our second win of the tournament but Thailand bowled very well and we had to battle hard to get to 220,” said Garth. “I thought we bowled pretty well but they had wickets in hand for most of the second innings so were right in contention for most of the match. Ireland 218-7 in 50 overs (Kim Garth 98, Laura Delany 50, Ratanaporn Padunglerd 2-25, Suleeporn Laomi 2-56). Thailand 172-9 in 50 overs (Nattaya Boochatham 44, Sornnarin Tippoch 42, Lucy O’Reilly 3-28, Ciara Metcalfe 2-25, Amy Kenealy 2-12).